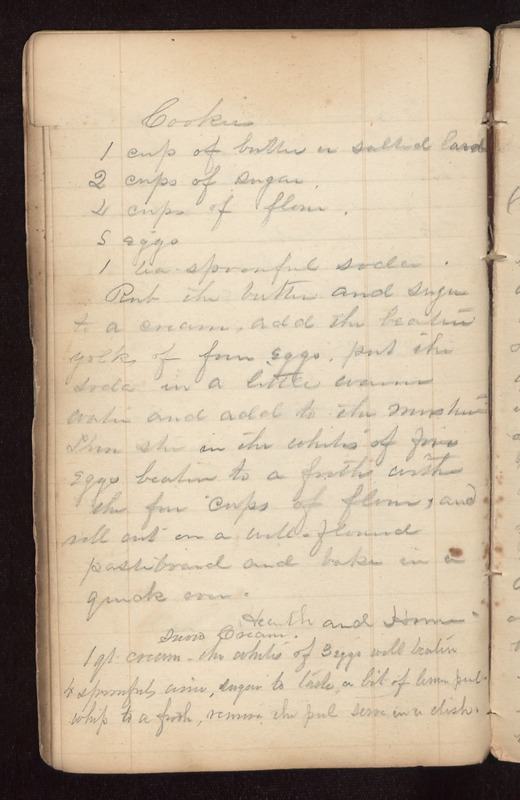 Cookies 1 cup of butter or salted lard 2 cups of sugar 4 cups of flour 5 eggs 1 tea-spoonful soda Rub the butter and sugar to a cream, add the beaten yolks of five eggs. Put the soda in a little warm water and add to the mixture. Then stir in the whites of five eggs beaten to a froth with the four cups of flour, and roll out on a well-floured [pastriboard?] and bake in a quick oven. Hearth and Home Snow Cream. 1 qt. cream, the whites of 3 eggs well beaten 4 spoonfuls wine, sugar to taste, a bit of lemon peel. Whip to a froth, remove the peel serve in a dish.